Its official! MINI of Pittsburgh proudly has a MINI Coupe on its lot! The Coupe is a gorgeous blue color, fast, and AWESOME! We could not be happier to have one on our lot considering they are not coming to dealerships until October. The MINI Coupe is the brand new two-seater from MINI that guns around corners like a golf-cart with some serious speed. The handling and speed combination of the Coupe is a brand new experience for MINI vehicles that enthusiasts can’t wait to try out. You’ll love not only the driving experience of the Coupe but also the fuel efficiency. The MINI Coupe pulls in 37 mpg on the highway and 29 mpg in the city. The Coupe is an amazing driving experience AND avoids trips to the gas station! MINI of Pittsburgh is accepting pre-orders so please stop in and pre-order your Coupe and check a glimpse of our Coupe on the lot before its gone! Considered one of the biggest auto shows in the world, the 2011 Frankfurt International Motor Show (IAA) is poised for another year of the latest and greatest displays in the auto industry. Just two years ago, the MINI Coupe took the stage as a concept car that wowed visitors to the show. In 2011, the MINI Coupe is a reality and being produced by MINI for an October release. The MINI Coupe will be on full display for visitors at the IAA and is ready for the attention. The auto show takes place from September 15-25 in Frankfurt, Germany. The two-seater MINI was a complete new dimension for MINI and one that has been met with great optimism by MINI enthusiasts. The MINI Coupe offers a sporty drive that handles like a go-kart. The super agile MINI Coupe gives drives a quick car that can take corners like a champ but still holds your luggage for a trip. The MINI Coupe also is fuel efficient, grabbing 37 mpg on the highway and 29 mpg in the city. Drivers can go 488 miles on a single tank or Pittsburgh to Chicago, for example. The MINI Coupe comes in three available versions, the Cooper Coupe (121 hp), Cooper S Coupe (181 hp), and John Cooper Works Coupe (208 hp). The MINI Yours collection offers plenty of options and accessories to customize each Coupe to their driver. 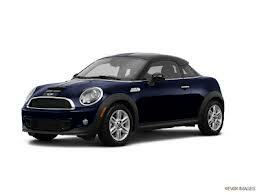 MINI Coupes are currently available for preorder at MINI of Pittsburgh.